Austin failed to win their second home game in a row as the Utah Warriors rolled into town to take a win in their first match of the season. It was Utah who started the scoring early on as openside flanker Ara Elkington got onto the end of a pass to the wing and Tim O’Malley converted the score with ease. Austin then got back into the game to make things a more exciting affair at the Dell Diamond. Timothee Guillimin kicked two penalties to bring his side back into contention, however Alf Daniels’ side had other ideas. Blindside Lance Williams went over the line after breaking away from a driving maul. Yet again, O’Malley converted the score to keep Utah in the ascendency. Guillimin brought the first half to a close with his third penalty of the game and that also signalling the end of Austin’s points scoring. The second half was not as eventful. An O’Malley penalty in the 73rd minute was the only noteworthy event. NOLA won their second consecutive game in impressive fashion, defeating last years finalists, the Glendale Raptors. JP Eloff kicked the first points of the game for NOLA, but his penalty was swiftly followed by Taylor Howden’s combative try just nine minutes in. Eloff converted the score. William Monro then pulled one back for Glendale and Robbie Petzer converted the try to draw the visitors closer to their hosts. Neither side was finished for the first half either. Another JP Eloff penalty followed Zack Stryffeler’s try for the Gold and that happened just minutes before John Ryberg’s score on the wing. Eloff kicked a penalty to end the half. Howden scored a second try after interval as the New Zealander threw two dummies in the process. Eloff converted Howden’s second try, but then Glendale would score two tries on the bounce. Raptors captain Luke White was the first to cross the whitewash, with Monro following soon after. Only White’s score was converted by Petzer. Former Queensland Reds player Scott Gale was the next to have a say. The Australian went through virtually unchallenged, but Eloff could not convert the try. The former Eagle did convert Tristan Blewett’s impressive score virtually on the touchline. That score put NOLA to the 40-point mark, but Glendale would make the final minutes competitive with Brendan Daly’s late try. However, NOLA saw out the late challenge to stay at the top of the table. As we saw in the UK this weekend, weather does often play a large factor in the manner that games of rugby are played. 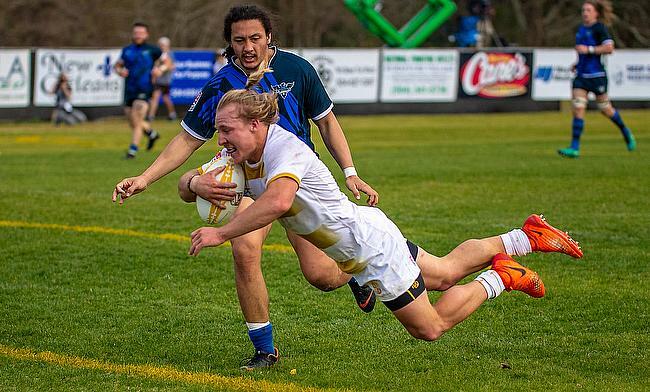 There were horrendous conditions in San Diego as the Legion beat current MLR champions Seattle. It took 26 minutes for a score of any note as San Diego were given a penalty try after Seattle were consistently adjudged to have been causing problems in the scrum. Thank you to all of our fans who came out to support today. We know it was rough. But we put on a good show!! Brock Staller would finally give the Seattle faithful something to cheer about. The wing kicked a penalty that was wiped out quickly by Mike Te’o’s intelligent score. Throwing the ball in early, Te’o received the ball back from Paddy Ryan to dive in at the corner. Nick Boyer smartly converted from the touchline, ending the scoring for the half. Weather conditions didn’t improve over half time and like in the first period, neither side could gain an advantage early on. It took 10 minutes until San Diego kicked a penalty through Boyer. Seattle got a foothold from that stage in as William Rasileka scored a powerful try for the visitors, taking a couple of the Legion players with him. Staller converted the try to keep Seattle in the running and would kick a penalty in the 70th minute, but San Diego had done enough for the win.